I see that this week it was the 65th birthday of none other than Errol Brown. Who? I hear you ask (I don’t really, I’m just surmising). Errol Brown, lead singer of Hot Chocolate, drinking chocolate, Hot Chocolate, drinking chocolate. Anyone else remember that ad for Cadbury’s drinking chocolate (which I just happen to love, should any execs from Cadbury’s want to give us a tub or two for this bit of product placement. It goes down exceedingly well with a Killie pie.). Anyway, back to Errol Brown becoming an oap. Always thought he looked and sounded as if he was going to start crying. You watch any clip of Hot Chocolate and you’ll understand what I am getting at. So to start us off today, here’s a little toon. Thank you Arthur. Ahem, let us gramble. Before we start I should highlight a wee change to The Grambler’s fundraising page. We felt it was a bit rude so we have made it more ‘family friendly’ by changing the name to The Grambler’s Kick Cancer’s Backside Fund. A small change, I grant you, but a better name we think. So, if you feel inclined to make a donation to a charity in the run-up to the festive season, please do consider this one. Go to http://www.justgiving.com/Geraldine-Smith3 to see how the fund is going (28% of the target last time I looked). May I begin this week’s Grambler predictions with a mild expletive - Damned international friendlies!! Thanks to a bunch of totally meaningless games the fixture list for Saturday the 16th of November has been well and truly fmucked up. 34 senior games! 34! That’s all there are this Saturday. And because Sky/BT aren’t interested in these lower league games they are all on at 3pm. Well, that’s something I suppose. I have just been handed The Grambler’s predictions – thank you, Arthur – and at least they are a bit more varied than last week’s. This week we have 2 home wins, 2 draws and an away. Not bad, do I hear you say? Hmm. Wait til you see who is predicted to win away from home. For our first prediction The Grambler brings us to the delightful borough of Brentford, to Griffin Park where the Bees play host to the Railwaymen. So Brentford’s nickname is the Bees; I always thought they were the Nylons. Orl right? Right. Not arf. * Are you there Watford fans? They are called the Bees because there are bees on their emblem. See? That makes sense. Not a moose head. Hornets indeed. Any road up, The Grambler predicts a draw. Grambler! What are you doing to us? There’s Brentford – 4 wins on the bounce and Crewe who haven’t won a game for a month and you reckon it’ll be a draw? Have you seen the league positions? Brentford in fifth and where are Crewe? 22nd! That’s where. A draw? And last season? Brentford cuffed Crewe twice! 5-1 and 2-0. A draw? I despair; I really do. Motherwell link: Brentford midfielder Alan McCormack joined Motherwell in 2005 on loan from Preston North End (via Leyton Orient and Southend United). He only played 28 games (scored twice) but managed to get yellow carded 12 times and sent off once. *How many of you, like me, remember Alan ‘Fluff’ Freeman doing the Brentford Nylons advert in the 60s? The Grambler’s second prediction takes us to Memorial Stadium (or the Mem as the locals call it) where the Pirates (or the Gas if you prefer the derogatory nickname) play host to the Shakers. The Grambler reckons that Bristol Rovers will take all 3 points. Hmm. Neither side is exactly setting the heather alight – Rovers sit 20th in the league, Bury 22nd and only one point separates the two. Hmm. What about previous encounters between them. Nope. The last time they met was 6 years ago, so not a good guide. Hmm. Both have similar recent results; the last three games have been 1 draw, 1 win and 1 loss. Hmm. A draw might seem more likely, but hold on there, Bury’s 4 points came against opposition sitting in the lower half of the league, whereas Rovers’ points came from a draw against 3rd placed Chesterfield and a win against 2nd placed Oxford United. That suggests that The Grambler could well be on to something. I think he/she/it could well be right. Motherwell link: Bristol Rovers defender/midfielder Jim Paterson played for Motherwell between 2004 and 2008. He played 124 times in all. Also a Rovers’ player is striker David Clarkson who played for ‘Well between 2002 and 2009. During his time there he played 219 games and scored 49 goals. And Phil O'Donnell was his uncle. Our third game takes place at Glanford Park where the team with perhaps the most unfortunate name in football play host to the team with the best. Luckily Scunthorpe’s nickname doesn’t utilise any section of the actual name; they are known as the Iron. I bet away supporters have another name for them [That’s enough –Ed]. What does The Grambler predict? Oh no! 23rd placed Stanley to beat 8th placed Scunthorpe. Ha ha ha. Accrington Stanley? Win? Never in a million…oh hold on…Stanley have actually started winning the odd game. Oh, unbeaten in five in the league. They were beaten by Tranmere Rovers in the cup last week, but they are from a division above. Hmm. Maybe Grambler. Maybe. For our fourth encounter The Grambler takes us to Ochilview Park where Stenny play host to the Red Lichties. The Grambler has gone for the safe option here by picking Stenny in 4th place to beat Arbroath in 7th (doesn’t sound much of a difference but remember the division has only ten teams in it). Stenhousemuir have already beaten Arbroath this season in a great 4-3 game. Now, can Stenny do it again? At home as well. Of the past four meetings Stenny are unbeaten, winning two and drawing two. Can they win this one? The Grambler says yes. I’ll go with that. Motherwell link: Stenny midfielder Darren Smith began his career at Motherwell and between 2004 and 2010 played in 72 games and scored 8 goals. Arbroath forward Lee Erwin is on loan from Motherwell. After last week’s defeat at home to Dundee United – Can we have him back? In fact, can we have them both back? And finally Cyril? And finally Esther we head to Balmoor where the Blue Toon play host to the Shite. Sorry Shire. The Grambler predicts that this encounter will end as a draw. Why? Grambler, why? Did you see last season’s results between these two? Peterhead scored 16 goals in four encounters. An average of four goals a game (I put that in just to show I can do sums). And you think East Stirling can change all that and get a draw? East Stirling are the league leaders this year (much to their and everyone else’s surprise) I will grant you, but to actually get a point off free-scoring Peterhead? I don’t agree, but hey, this is random gambling. Why not? So there you have it fellow gramblers. The bet is placed and the big question is – how much could we win [but probably won’t – Ed] for The Grambler’s Kick Cancer’s Arse Backside Fund this week? Well, if all the predictions are spot on [Oh, aye, sure – Ed] for my 2.2 quids bet the fund will be over 92 quids better off [or £2.20 like every other week – Ed]. To finish, I know you all want to know how the Movember moustache is growing. Well, the answer is – yes. As in, yes it is growing. Whether it looks like a moustache? The jury is out on that one. Let’s finish with a picture of someone who knew how to grow a moustache and wasn’t afraid to combine it with a faintly ludicrous combover. 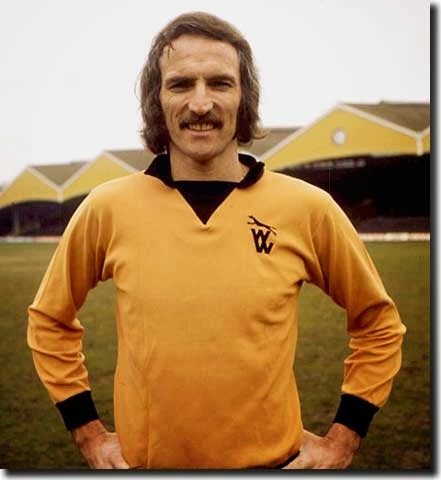 Ladeez and genullum I give you Northern Ireland and Wolves legend, the late, great Derek Dougan.